Ms. Lisa has been a lifelong Brevard resident, having grown up in Rockledge and moving to the “Island” 31 years ago. She is married with two grown daughters and four grandsons. She has been in the early childhood field for 18 years. She has worked with all age groups and has been the Director at Faith Lutheran since the beginning of October 2017. She had previously been the Director at Grace Lutheran Preschool for 8 years and their three year old teacher for two years. Ms. Lisa has earned her A.S. in Early Childhood Education at Eastern Florida State College. 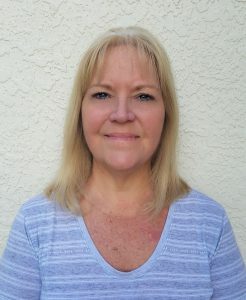 She has her Florida Child Care Professional Credential (FCCPC), all of the required VPK certifications required by the Florida Department of Education, and also holds a Florida Child Care & Education Program Director Credential with a VPK endorsement. When she is not with the children of Faith Lutheran, she enjoys spending time with her grandsons, as well as boating with her husband and family. You may contact Ms. Lisa by calling the school office at (321) 452-4143 or by using our Contact Us form.